Over the years pregnant women have asked to report their details to UKTIS directly so that this information is available to other women who may need to consider whether or not to take a certain medicine in the future. Our new online reporting facility offers all pregnant women (not just those taking certain medicines or whose pregnancies did not result in a healthy baby), or women who have been pregnant in the past, the option to create their own password protected ‘my bump’s record’. www.medicinesinpregnancy.org to find out more. This study is being carried out to test new ways of collecting information on lifestyle factors, health, and use of medicines throughout pregnancy in a large number of pregnant women. This information is needed to help find out more about the safety of medicines in pregnancy, so we can improve the advice given to pregnant women who need to take medicines. Recruitment into this study has now closed. 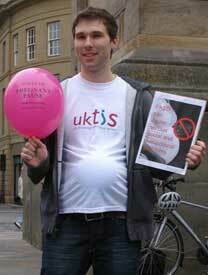 Coming soon - UKTIS are about to launch their first patient information leaflets regarding medication use in pregnancy. The estimated delivery date is very soon so please keep checking back regularly to be the first to see our newborn arrivals!! UKTIS will again be attending the Royal College of General Practitioners Annual Primary Care Conference in Glasgow from 3rd of October. Come and see us at stand 87 to hear about the launch of our new ‘UKTIS BUMPs’ patient information leaflets. UKTIS will be holding a workshop on principles of prescribing in pregnancy at The Neonatal and Paediatric Pharmacists Group 18th Annual Conference and Exhibition to be held in Liverpool in November. 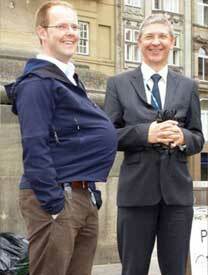 Join us on Saturday 10th November in session ‘B’ to learn about safer prescribing in pregnancy. As part of UKTIS’ commitment to continued provision of teratology information to health care professionals, we will be taking part in the British Pharmaceutical Students Association Pennine Area Conference on Pregnancy and Breastfeeding, Saturday 12th November at Bradford University. 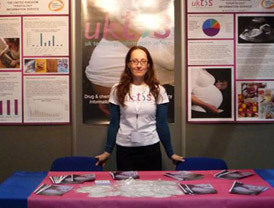 Alongside experts in midwifery and scientific experts on the subject of medication use in breastfeeding, UKTIS will be delivering a presentation to students and pre-reg pharmacists explaining the basic science of teratology whilst focusing on safe medication use by pregnant women, and how pharmacists can improve this safety. In addition to the presentation, a workshop identifying the risks associated with antidepressant medication use in pregnancy and considering the clinical relevance of these issues will be overseen by UKTIS. On the 20th of October UKTIS attended the Royal College of General Practitioners Annual Primary Care Conference. Thanks to everyone who came to talk with us. 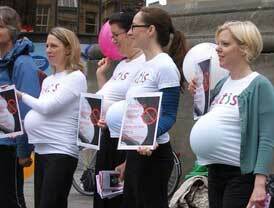 On Friday 9th September ‘Pregnant Pauses’ were held in cities around the UK to raise awareness of fetal alcohol spectrum disorder. This year Newcastle took part by holding an event in the city centre.